Social relationships play a central role in the evolution and development of human culture and cognition. 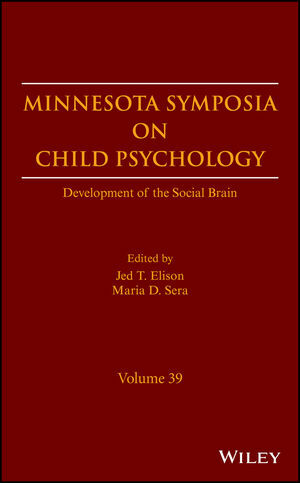 Volume 39 of the Minnesota Symposium on Child Psychology (Development of the Social Brain) adresses the ontogeny and phylogeny of the social brain from multiple perspectives and levels of analysis. The chapters in this volume shed light on shared versus unique features of social information processing across different species, and sketch out some of the cognitive and neural mechanisms that underlie such processing. A collection of chapters from distinguished contibutors offer new insights into the unique nature of human development. Flexibly and efficiently navigating the complex dynamics of social interaction remains one of the remarkable achievements of human evolution. As life in social contexts evolved, so did information processing abilities that afforded new ways of interacting with others, emerging into what we now refer to as cultural cognition or cultural practices. The primary objective of the current volume was to consider phylogenetic and ontogenetic influence on specialized social information processing capactities. The volume brings together, for the first time, distinguished research scholars to consider central themes and principles associated with the development of the social brain. Readers will take away a fresh perspective on nature of human nature. Jed T. Elison, Ph.D., an is Assistant Professor at the Institute of Child Development, University of Minnesota, with joint affiliations with both the Departments of Pediatrics and Nueroscience. He has contributed to over 40 publications on child development. Maria D. Sera, Ph.D., is a Professor at the Institute of Child Development, University of Minnesota. She has contributed to over 40 publications on the development of language and its relation to cognitive development. She recently co-authored a National Academy of Sciences report on promoting language and educational success in dual language learners.